This total "foundation budget" is designed to represent the total cost of providing an adequate education for all students, and it is often expressed as a per-pupil foundation budget by dividing the total foundation budget by the number of students (as we do in the graph below). Once the total foundation budget is established, the state calculates each city and town 's ability to contribute local revenue towards the operation of its schools. Local ability to contribute varies widely based upon the incomes and property values of different cities and towns. The state expects that each municipality can contribute the same share of local resources to the foundation budget by setting uniform contribution rates. In FY 2011, for example, local contributions were determined by adding 0.3 percent of each town 's total property values to 1.4 perecnt of the income earned by residents of the town. The required local contribution is basically a measure of how much local tax revenue a city or town can reasonably raise and dedicate to the operation of its schools. Chapter 70 education aid is then determined by filling the gap between a district 's required local contribution and its foundation budget. Calculating state aid from the difference between steps 1 and 2 ensures that every district can fund the total baseline education determined appropriate by the foundation budget. The required local contribution is only a minimum amount that cities and towns must contribute to their school districts, and many wealthier communities opt to contribute significantly more. For this reason, the Chapter 70 formula provides a baseline school budget, but it does not ensure equitable total funding across the state. Please see the graph below for an example. In the example above, Lynn has a higher foundation budget than Newton but a lower total budget. Lynn 's foundation budget is higher mostly because it has a higher proportion of low-income and limited English proficient students, two categories of students that have higher associated costs when determining a foundation budget. Newton, however, is able to supplement its smaller Chapter 70 state aid with significantly more local revenue. 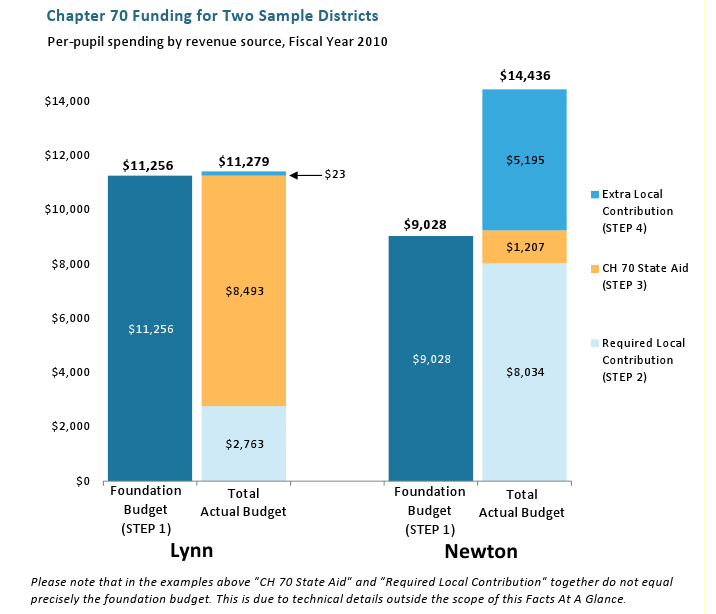 Notice that for both Lynn and Newton total funding is at least as high as their respective foundation budgets. The major difference, however, is that Lynn 's total funding level is essentially equal to its foundation budget (only $23 higher per student), whereas Newton 's is 60 percent greater ($5,400 higher per student). So even though Newton receives roughly $7,300 less per student in Chapter 70 state aid, it has greater local resources at its disposal, enabling it to provide enough supplemental local funding to produce a total per-pupil budget that is roughly $3,200 higher than Lynn 's. ISN 'T THE ACTUAL FORMULA MUCH MORE COMPLICATED THAN THIS? Yes it is, although the preceding section accurately describes the basic scaffolding of the formula. Following is a brief description of some of the formula 's additional features and complications, many of which relate to transition issues that arise each time the formula is modified. A set of reforms to the Chapter 70 formula were detailed in the FY 2007 budget and planned for a five-year phase-in through FY 2011. Since many of these reforms require additional state financial support, however, the national recession led to a slowing of this process, and they will not be completed this fiscal year. Major elements of the 2007 reforms included: increasing Chapter 70 aid statewide by changing the way local ability to contribute is calculated (see below); guaranteeing a higher minimum state aid amount that primarily benefits higher-wealth communities; updating data used in determining the allocation of education funding; guaranteeing minimum annual per-pupil aid increases of $50; and providing a new type of aid for communities with growing enrollment. For more detail on these planned reforms please see Public School Funding in Massachusetts: Where We Are, What Has Changed, and Options Ahead, November 2006, available here. A "preliminary contribution" is calculated by taking the previous year 's required local contribution and multiplying it by the Municipal Revenue Growth Factor, a rate that estimates growth in local revenues from year to year. A "target contribution" is calculated by looking at the specific property values and income wealth of a given community (as described above). If the Chapter 70 formula were run in its simplest form, according to the four steps outlined above, some high-wealth districts would not receive any state aid to fill the gap between their foundation budget and their local ability to contribute because for these districts their target local contribution, based upon local property and income wealth, is actually higher than their foundation budget. Since the formula 's establishment in FY 1994, however, there have always been provisions guaranteeing some base amount of state education aid to all school districts. The 2007 reforms increased this base considerably, shifting a greater proportion of state resources to these higher-wealth districts. Due to declining state tax revenues during the ongoing state fiscal crisis, Chapter 70 aid has been cut across the board during each of the last three fiscal years. The slowed phase-in of the 2007 reforms has also had the effect of slowing an increase in state aid that had been planned. Additionally, in FY 2010 the Legislature used an inflation factor in calculating Chapter 70 aid that was lower than the factor required by state law, resulting in reduced state aid for FY 2010 and for all subsequent years until it is corrected retroactively.6 Federal stimulus money during these three years has, however, offset some of these state cuts. Each time Chapter 70 aid has been cut, there have been provisions protecting individual districts from cuts that would bring total spending below their foundation budgets. For more information on the scope of cuts to Chapter 70 during the current recession, please see Fiscal Fallout: The Great Recession, Policy Choices, and State Budget Cuts available here. The Chapter 70 education aid formula was created by the Education Reform Act of 1993, landmark legislation that responded to growing concerns about school funding adequacy and equity in Massachusetts. Prior to Fiscal Year 1994, the state contributed less money to K-12 education, leaving school districts more heavily dependent on the local property tax. The Education Reform Act also served as the Legislature 's response to the State Supreme Court case McDuffy v. Secretary of the Office of Education, which found on behalf of a group of students from communities with low property values that the state was not living up to its obligation to provide an adequate public education to all children in the state. Adequate funding should be available to every school district to provide each child with a quality education. This adequate funding requirement comes from the State Constitution, which charges the state with ensuring sufficient funding levels in every district across the Commonwealth. In 1993, the Legislature constructed a model school budget to define "adequacy" by looking at the range of basic educational cost categories and calculating the total per-pupil budget necessary for the average school to educate its students. The original model school budget is the framework for the foundation budget. This model school budget was created almost two decades ago and, therefore, is based on an education cost structure that looked quite different than it does today. A full reexamination of the model school budget has not occurred in the intervening years, and would be useful for updating the formula to reflect major changes in education, such as detailed state standards and the implementation of the MCAS examinations. Local communities should each contribute to their schools according to their ability to raise tax revenue, based upon local property values and income levels. The state should provide enough funding for each school district to fill the gap between the baseline local ability to contribute and the funding level needed to provide each child with a quality education, as determined by the model school budget. This new funding commitment required a continuous net increase in state education spending over the course of the second half of the 1990s. A second major education finance case, Hancock v. Commissioner of Education, was filed in 1999 and charged that the state had not fulfilled its mandate to provide adequate education to all students as mandated in the McDuffy case. The State Supreme Court ruled in 2005 that while the process of education reform in Massachusetts should be improved, it found that the Legislature had made reasonable progress and no legal remedy was warranted. 1 The vast majority of education funding in Massachusetts comes from state and local government sources, with the federal government typically contributing only around 5 percent of school budgets. For more information on sources of education funding over time and to see how Massachusetts compares to other states, please see MassBudget 's Public School Funding in Massachusetts: Where We Are, What Has Changed, and How We Compare to Other States. 2Specific decisions about spending Chapter 70 aid money are left to districts themselves, and this form of state aid is separate from another form of state aid, "unrestricted general local aid," which supports other local services like fire protection and road maintenance. The state does distribute additional money for other specific education programs, such as a pilot program for schools operating a longer school day, but Chapter 70 aid represents by far the largest portion of state K-12 education funding. 3 Technically speaking, Step 4 occurs after the full Chapter 70 formula has been run, rather than as a part of the formula itself. We include additional local contributions, Step 4, as a part of this Facts At A Glance since they are an important part of the overall education funding system in Massachusetts. 4 There is also a wage adjustment factor that increases the costs of salaries in parts of the state where wages are higher than average.